Containers Archives - VIRTUALIZATION IS LIFE! VMworld 2016 is just around the corner (10 days and counting) and the theme this year is be_Tomorrow …which looks to build on the Ready for Any and Brave IT messages from the last couple of VMworld events. It’s a continuation of VMware’s call to arms to get themselves and their partners and customers prepared for the shift in the IT of tomorrow. This will be my fourth VMworld and I am looking forward to spending time networking with industry peers, walking around the Solutions Exchange on the look out out for the next Rubrik or Platform9 and attending Technical Sessions. The Content Catalog went live a few weeks ago and the Session Builder has also been live allowing attendees to lock in sessions. There are a total of 817 sessions this year, up from the 752 sessions last year. I’ve listed the main tracks with the numbers fairly similar to last year. My focus seems to have shifted back towards more vCloud Director and Network/Hybrid Cloud automation of late and it’s reflected in the choices above. Along side that I am also very interested to see how VMware position vCloud Air after the shambles of the past 12 months and I always I look forward to hearing from respected industry technical leads Frank Denneman, Chris Wahl and Duncan Epping as they give their perspective on storage and software defined datacenters and automation. This year I’m also looking at what the SABU Tech Marketing Team are up to around VSAN and VSAN futures. As has also become tradition, there are a bunch of bloggers who put out their Top picks for VMworld…check out the links below for more insight into what’s going to be hot in Las Vegas this VMworld. Hope to catch up with as many community folk as possible while over so if you are interested in a chat, hit me up! vCloud Air and Virtustream – Just kill vCloud Air Already?!? I’ve been wanting to write some commentary around the vCloud Air and Virtustream merger since rumours of it took place just before VMworld in Auguest and I’ve certainly been more interested in the whole state of play since news of the EMC/VMware Cloud Services spin off was announced in late October…the basis of this new entity is to try and get a strangle hold in the Hybrid Cloud market which is widely known to make up the biggest chunk of the Cloud market for the foreseeable future topping $90 billion by 2020. VMware will establish a Cloud Provider Software business unit incorporating existing VMware cloud management offerings and Virtustream’s software assets — including the xStream cloud management platform and others. It grabbed my attention not only because of my participation in the vCloud Air Network but also because the knives have been out for vCloud Air almost before the service was launched as vCloud Hybrid Services. The post its self from Nitin though brief, was suggesting that VMware should further embrace it’s partnership with Google Cloud and just look to direct VMware Cloud customers onto the Google Cloud. The suggestion was based on letting VMware Orchestrate workloads on Google while letting Google do what it’s best at…which was surprisingly Infrastructure. With that in mind I want to point out that vCloud Air is nowhere near the equal of AWS, Azure or Google in terms of total service offerings but in my opinion it’s never been about trying to match those public cloud players platform services end to end. Where VMware (and by extension it’s Service Provider Partners) does have an advantage is in the fact that in reality, VMware does do Infrastructure brilliantly and has the undisputed market share among other hypervisor platforms therefore giving it a clear advantage when talking about the total addressable market for Hybrid Cloud services. Without going into too much detail around each option…at a higher level where vCloud Air and the vCloud Air Network has the advantage in that most businesses I come across are not ready to move into the cloud holistically and for the next three to five years existing VM workloads will need a home as businesses work out a way to come to terms with an eventual move towards the next phase of cloud adoption which is all about platform and software delivered in a cloud native way. Another reason why vCloud Air and the Air Network is attractive is because migration and conversion of VMs is still problematic and a massive pain (in the you know what) for most businesses to contemplate undertaking…let alone spend the additional capital on. A platform that offers the same underlying infrastructure as what’s out there as what vCloud Air, the vCloud Air Network partners and what Virtustream offers should continue to do well and there is enough ESXi based VMs out there to keep VMware based cloud providers busy for a while yet. vCloud Air isn’t even close to being perfect and has a long way to go to even begin to catch up with the bigger players and VMware/EMC/DELL might well choose to wrap it up but my feel is that that would be a mistake…certainly it needs to evolve but the platform has a great advantage and it, along with the vCloud Air Network should be able to cash in. In the next part I will look at what Virtustream brings to the table and how VMware can combine the best of both entities into a service that can and should do well over the next 3-5 years as the Cloud Market starts to mature and move into different territory leading into the next shift in cloud delivery. 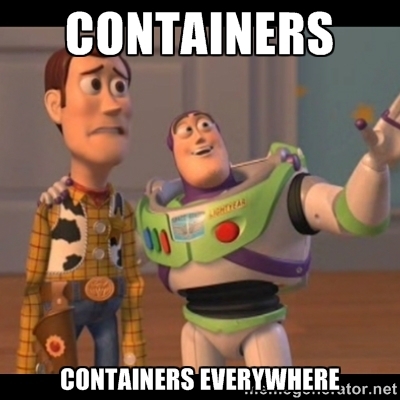 Containers Everywhere…Are we really ready? Depending on what you read, certain areas of the IT Industry are telling us that there is a freight train coming our way…and that train is bringing with it containers. With the recent release of container platforms from Microsoft and VMware it seems as though those that control the vast majority of the x86 platforms around the world are taking notice of the containers movement. Docker is the poster child of the push towards 3rd Platform Applications with many others looking to cash in.While there is no doubt there is a lot of benefit in the basic premise of what containerized applications offer the biggest question for me is how seriously we take the push in the real world of IT. What do I mean by the real world of IT? Well this is a word where orginizations are only just now starting to accept Cloud based platforms to deliver Platform and Software as a Service. It takes time for trends to reach the top of enterprise, and this is what we are certainly seeing now when it comes to the uptake of those Cloud services. In the real world of IT, organizations are still running legacy applications on what some people call legacy platforms. Depending on who you talk to that definition of legacy platforms differs…some even say that virtuatization is legacy even now. Being realistic about what is legacy or not…the way in which IT is consumed today is not going to suddenly switch on mass to a containerized model any time soon. IT is only just now working out ways of better consuming Cloud based services by way of maximizing APIs interfaces and using the middleware that harneses their power. In reality the real shift to a wider adoption of 3rd Platforms is happening in a place that you may not think about too often…University Campuses and the students of today who will become the IT professionals of tomorrow. My peripeteia moment in coming to the conclusion that it is important to start to learn and understand about containers and 3rd platform applications came when I asked a couple of local software developers (who are quiet accomplished) about Docker and if they had done any container development…to my surprise the response I got was…”What are Containers and what is Docker? Now, before the conclusion is drawn that the devs in question where out of touch…consider this. When this particular generation of developers went through university they may have started coding in Pascal (as I did), but more likely started in Java or C++…they also didn’t have virutalization in their lives until the mid to late 2000’s…When they where writing code for projects it wasn’t being uploaded and run off AWS based instances or anything to do with Cloud. We live in a “legacy” world today because the generation of coders that create and produce the applications we consume today know about how best to exploit the tools they learnt with…There will be a shift…and I believe a dramatic one to 3rd platform apps when the current generation of university students graduate and get out in to the world and start to develop and create applications based on what they know best. This week VMware announced information around their Cloud Native Apps strategy…VMware Photon and Lightwave are aimed at the ever growing Container market with VMware open sourcing their own lightweight Linux Microservice Server released as Photon. Photon is optimized for vSphere and vCloud Air …and by extension vCloud Air Network Service Provider platforms. I wanted to be able to offer Photon pretty much right away for ZettaGrid clients so I went about downloading the Tech Preview and created a shared Catalog vApp that can be deployed on any of ZettaGrid’s three Availability Zones. In the video below I go through deployment of the vApp from the ZettaGrid Public Catalog, setup and run the nginx Docker container app example on the Photon VM and configure the networking using the MyAccount Portal in combination with the vCloud Director UI. A Spare IP Address to publish the nginx web server. So there you go…Photon is good to go and hopefully we can start to see an uptake of Container Based workloads running on vCloud Air and Air Network Platforms. Looking forward to what’s to come in this space!